There are lots of great things about being left-handed, but it can sometimes be hard trying to learn to do something in a right-handed way or with right-handed tools. Nowadays, many schools are realising that it's not fair to make us left-handers do things "back to front" and that left-handers deserve to be just as comfortable when they learn. There are lots of really useful left-handed teaching aids and equipment that are now available to schools, but some teachers still aren't using them! That's why we're asking you to fill in this survey to tell us how well your school looks after left-handed pupils. Please complete as much of the survey below as you can by ticking the relevant boxes and adding your comments in the boxes on the right. If you have left-handed brothers/sisters or children at school please get them to complete the survey too. We will review all surveys submitted and report on them in the next Left-Handers Club Newsletter as well as preparing a report to be issued to the press for Left-Handers Day on August 13th. If the survey confirms the impression we get from members' emails and letters that there is still a challenge facing left-handers in school, we will also be following up with a campaign to make more teachers aware of the needs of left-handed children. The survey should only take about 5 minutes to complete - depending how many comments you have! Have you ever had any problems with handwriting? Did your teacher let you move? Have you ever been given a special left-handed ink pen with a left-handed grip and nib? Have you been offered a pen / pencil with a left-handed or triangular grip to help your finger position? Do you know there are special scissors with reversed blades so they work properly for left-handers? Do you have left-handed scissors in your classroom? Have you or your parents asked the school to provide left-handed scissors? Are there any tools or equipment you find hard to use at school because you are left-handed? Do you think your teachers notice you are left-handed and check to make sure you can do things in a comfortable and safe way? Which hand do you prefer to use for your mouse? Does your school let you use it left-handed if you want to? Are shared workstations a problem (having to change it from right to left)? If you take woodwork / metalwork / Design Technology or similar classes, have you seen over-ride switches or safety devices on equipment that are more difficult for a left-hander to use? If you take textiles, do you find you sew / knit / crochet in the opposite direction to right-handers? Has your textiles teacher helped you reverse sewing patterns and techniques? If you play right-handed, was it your choice or were you required by teacher / parent ? Do you think being left-handed has given you an advantage in any sports? Has being left-handed made any sports more difficult? 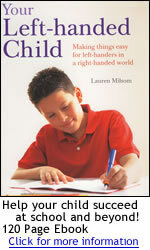 Do you think your school should give greater consideration to the needs of left-handed students? Thank you very much for your time in completing our survey. We are sure the responses will reveal new information on the treatment of left-handers at school and help us to increase awareness of the requirements for helping left-handed children. We will report on our analysis of the responses and any action we are takling as a result in the Left-Handers Club newsletters.